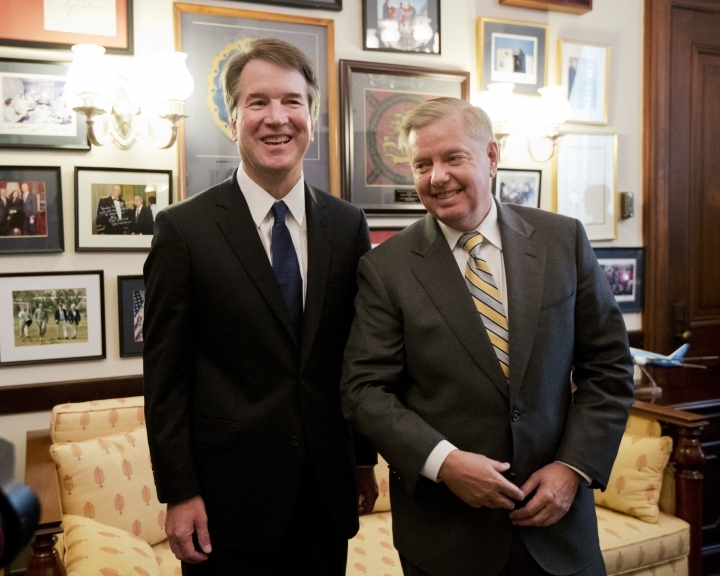 WASHINGTON — Supreme Court nominee Brett Kavanaugh returned to Capitol Hill on Wednesday for a whirlwind round of meetings with key Republican senators as Democrats ramped up efforts to block his confirmation. 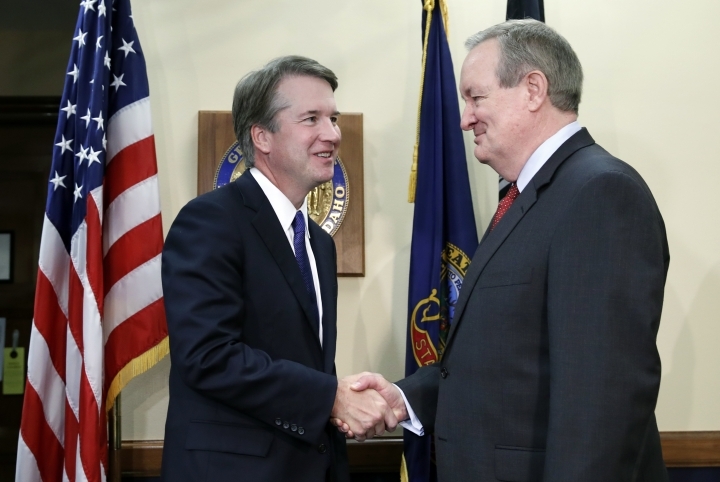 Kavanaugh, the conservative appellate court judge and President Donald Trump's choice to replace retiring Justice Anthony Kennedy, was meeting separately with at least five members of the Judiciary Committee. The panel will launch confirmation hearings later this summer. 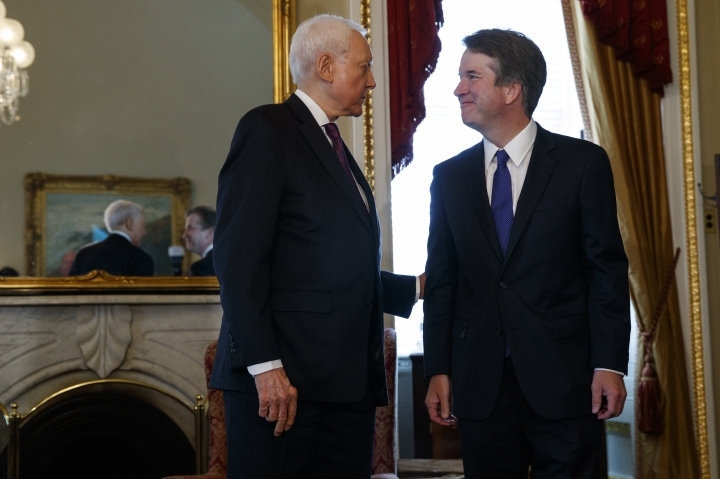 Republican Sen. Orrin Hatch of Utah, who had conferred with Trump on making his second pick for the court, called the Yale-educated judge "a very fine man" and told reporters he expects Kavanaugh's confirmation to go well. 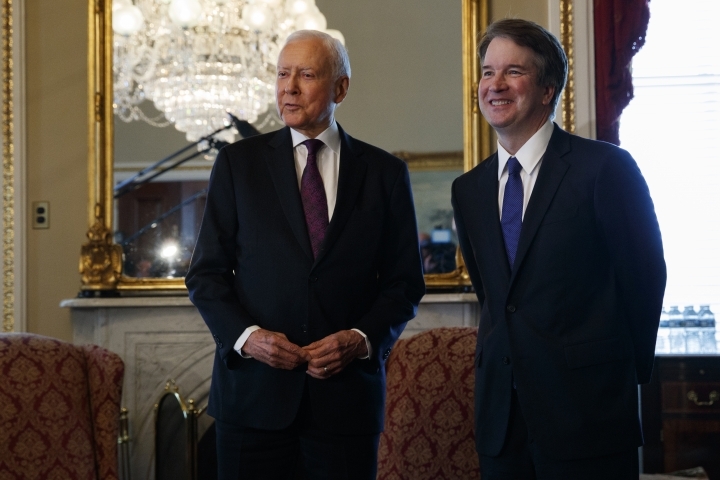 "There will be the usual attempts to sully his reputation, not only in the Senate but outside the Senate, but he'll be able to handle it, and I have every confidence he'll be confirmed," Hatch said. 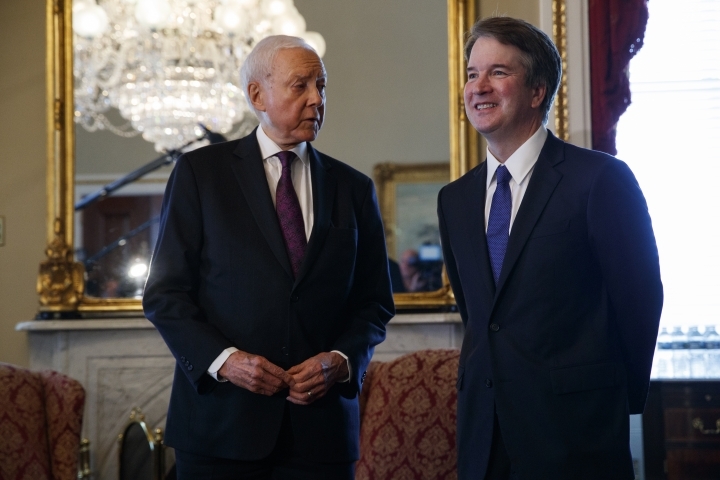 But Kavanaugh has an unusually long paper trail for senators to review, including judicial rulings and documents from his tenure in the George W. Bush administration and on Kenneth Starr's investigation of President Bill Clinton. Aides say it could take weeks to assemble those materials. Democrats, as the Senate minority, have few options to block Kavanaugh. But they can use the time to make the case that confirming Kavanaugh will tilt the court too far to the right. They warn that Kavanaugh could be part of majority decisions rolling back women's access to abortion and undoing aspects of the Affordable Care Act. Democrats are also raising red flags over Kavanaugh's past writing that suggests investigations of sitting presidents are a distraction to executive branch leadership. 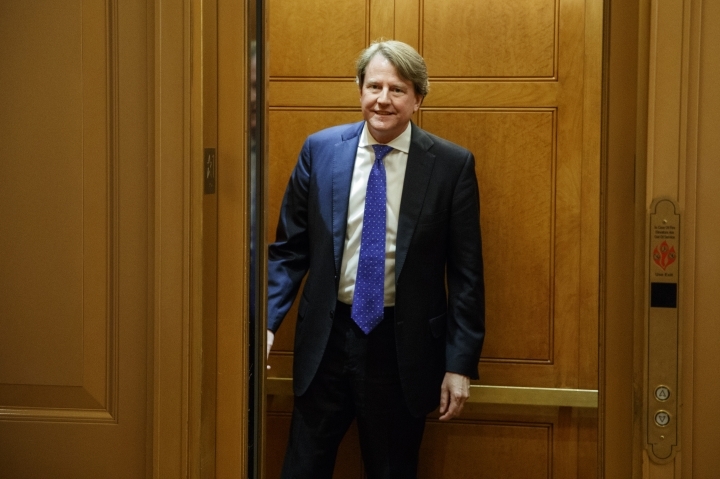 They see that as concerning amid the special counsel's investigation into Russian interference in the 2016 election and Russian ties to the Trump campaign. "The American people should have their eyes wide open to these stakes," said Sen. Chuck Schumer, D-N.Y., the minority leader. Republicans want to have Kavanaugh confirmed by the start of the court's session in October and before the midterm election. Cornyn acknowledged Trump's choice of the judge was "a little bit of a calculated risk ... because Judge Kavanaugh has the longest paper trail" of any potential nominee. 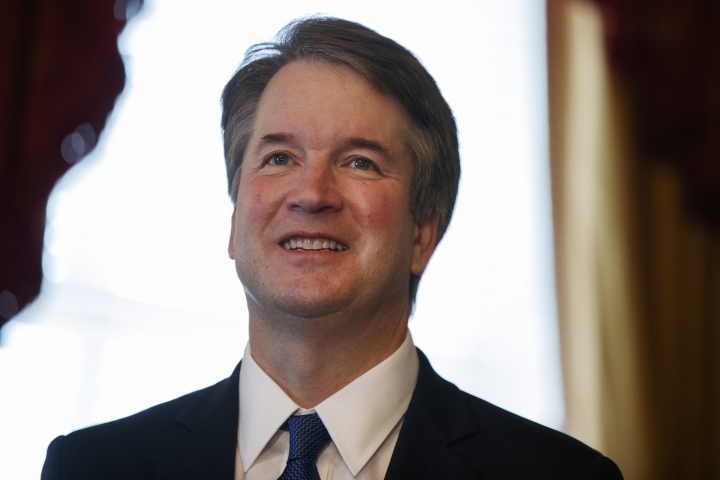 Kavanaugh was first confirmed to the appellate court in 2006. On the other hand, Cornyn said, Trump should be congratulated for nominating somebody whose record is so long that "people can evaluate on their own, fairly." Republicans are pushing for a bipartisan showing of support for Kavanaugh by trying to peel off Democrats who are up for re-election from Trump-won states. That group includes Sen. Joe Donnelly of Indiana, Sen. Heidi Heitkamp of North Dakota and Sen. Joe Manchin of West Virginia, who all voted for Trump's initial Supreme Court pick, Neil Gorsuch, last year. Democrats warn that with GOP-backed lawsuits to unravel "Obamacare" headed to the court, Americans are again facing threats to undo protections for people with pre-existing conditions. The two GOP senators also support access to abortion services. "We won this battle in the light of day last year," said Sen. Chris Van Hollen, D-Md. "We need the American people to weigh in." Michael Brune, executive director of the Sierra Club, the nation's largest environmental group, said Kavanaugh "continually and reliably sides with corporate polluters and the wealthy over the public's right to breathe clean air and drink clean water." In his dissent, Kavanaugh wrote that it came as a "surprise" that the EPA did not consider costs and said the agency's failure to do so was "unreasonable," citing significant costs for industry to meet the regulations.